Caracas, March 28, 2018 (venezuelanalysis.com) – Thirty-two campesinos from Venezuela’s Merida state, arrested on March 16 and charged with illegally occupying land and contempt of court, were released Sunday. The sudden freeing of this group, which includes two women and their babies and a person with cancer, has been hailed as an important victory for the campesino movement in its attempt to occupy and produce on idle land in Venezuela. Last year, the campesino group occupied and began to grow food crops on an estate called “La Magdalena,” which was formerly property of the Aranguren family. They did so based on a ruling by Venezuela’s National Land Institute (INTI) declaring the land to be idle and fit to be recovered. 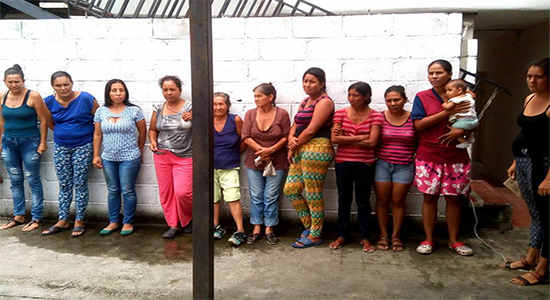 Despite the INTI’s favorable ruling, the investigative police force, CICPC, and the National Guard, acting on behalf of the Aranguren family, arrested the campesinos, who spent more than a week in El Vigia jail in Merida. Their situation became a cause celebre because of the images of a mother and her nursing child in prison. Campesinas of La Magdalena in El Vigía jail, Merida state, in early March. Now set free and with the court’s decision in their favor, the victorious campesino group will return to producing on the occupied land and try to complete the process of legalization, explained local campesino leader Heber Castillo in an interview with Venezuelanalysis. As is common in Latin America, Venezuela’s population is concentrated in big cities such as Caracas, Maracaibo and Valencia, leaving much of the land in the sparsely populated countryside concentrated in large underproductive estates called “latifundios.” Faced with this disparity and the need to build a more productive country, the late President Hugo Chavez attempted a bold land reform in 2001 and later encouraged the occupation of underused land. Five years after Chavez’s death in 2013, the Magdalena’s occupiers may be suffering from the winds of shifting policy. According to analyst Marco Teruggi, land occupation has met with greater resistance since 2010. The emergence of a generous legal framework for seizing and distributing land that took shape in the early years of the Bolivarian process has given way to a period in which support for humble homesteaders may be waning, the analyst claims.